I suppose if I had been wearing tight leggings and a chest enhancing top advertising Carole Nash or MCN I may have gained more attention (although I suspect for all the wrong reasons). Anyway, once I had the nice Helmet City man’s attention I did receive good customer service. 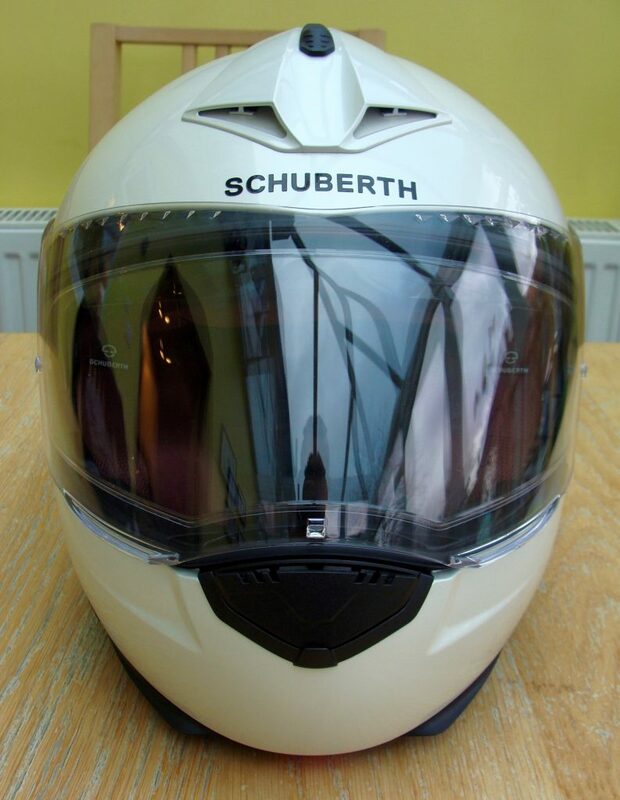 I had a choice of one Schuberth model. I did try on others, but found XS’s were too big and XXS’s were too tight. 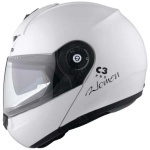 So I ended up trying on the C3 Pro Woman (not C-3P0, but if any helmet designers are reading, that would be an awesome option…) So this helmet ticked all of the boxes; it had a microlock ratchet fastener which is much easier than fannying about with a D-lock. It has the sun flap thing which is really useful in the changeable weather we have been having recently. It has a Pinlock visor which I consider essential as a speccy rider. The flip lid feature which I had not thought about before, has been really useful- especially when buying petrol or going to the loo. I can flip the lid open without having to faff about removing glasses and lid. 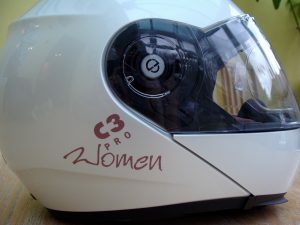 Because this is a helmet designed for women it comes with some other ‘lady-specific’ features. It is narrower than standard helmets to fit smaller female faces. It has specific higher padding around the cheekbones designed to fit women better. In this helmet I am a small rather than an XS. 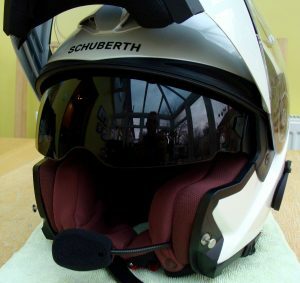 It did fit me more comfortably than the standard Schuberth helmets did so I think this is more than just a gimmick. It also has and I quote marketing blurb here “anti-bacterial microfibre interior prevents staining from make-up.” Not a primary concern of mine to be honest, but some women riders wear make up when riding. The antibacterial lining is of value in preventing sweaty smells though, and the cheek pads can be taken out and washed or replaced as needed. 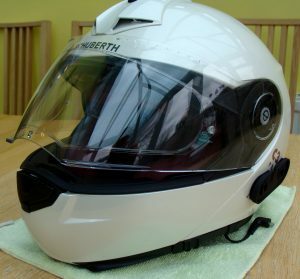 In my first couple of days use I have been really impressed with the general quietness of the helmet, the lack of wind noise and the ease with which I can put it on and take it off. 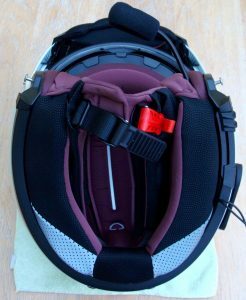 The sun visor is easy to use and the main visor stays mainly fog free when riding. It is also really comfortable and feels tight as it needs to without giving me the Trout Pout Instagram Face. One thing that I was not particularly impressed with however is the lack of colour choices. Given that in the C3 Pro (I note it isn’t called the C3 Pro Men) there is a wide selection of colourways. 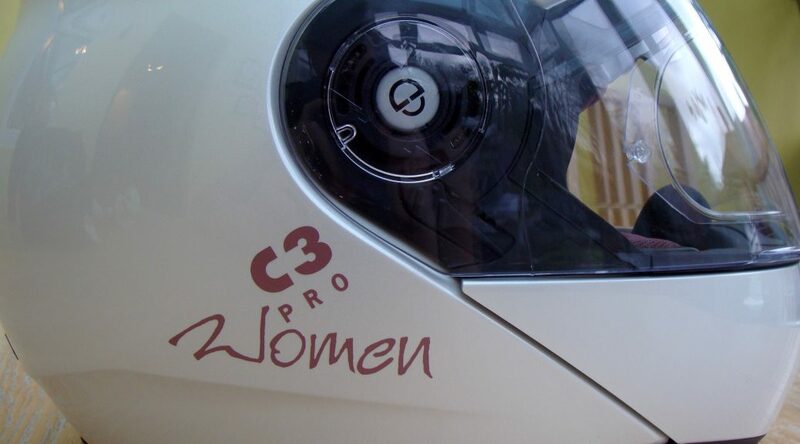 In the C3 Pro Women line there is a choice of Matt Black, Pearl White, Pearl Pink, White and ‘Euphoria’ which is white with swirly pink flowery patterns. At the show the choice was limited to Pearl White or Pearl Pink. I know I am a woman, I don’t need reminding of my gender by having a pink helmet sticker proclaiming it to all and sundry. I chose Pearl White which is a nice colour, if not a bit unexciting. I know some women like the pink stuff, but the pastel shade of this helmet just made me think of Barbara Cartland or the Queen Mum. The other addition which I think is completely unnecessary is the pink sticker on each side that says ‘Women’ in pink. I know I am a woman, I don’t need reminding of my gender by having a pink helmet sticker proclaiming it to all and sundry. The Man’s helmet doesn’t state he is Male, or Manly in blue stickers. Still, overall I am very impressed with the comfort and features of this helmet. I will peel the stickers off, which is fairly easy to do. And I will keep you all updated on how well this helmet continues to perform over the longer term.